Posted on May 30, 2018 April 24, 2019 , in Hot Tubs. If you are looking to upgrade your home or are in search of a new one, installing a hot tub is a great way to help improve the value. Why is that? Ultimately, there are not many home renovations or upgrades you can make that will provide you a return on investment. Continue reading to learn more about the top reasons a hot tub will help improve both your health and the value of your home at the same time. One option for hot tub installment is an indoor hot tub. Indoor hot tubs provide both privacy and the comfort of soaking in their own home. Typically, people install hot tubs in their basement as long as there are sufficient drainage and ventilation. Design choices may include adding a hot tub onto a home gym, spa, or sauna. Prospective buyers enjoy the idea of having a tranquil oasis where they can enjoy without having to take a step outside. Even more common is for homeowners to choose to install a hot tub in their backyard. 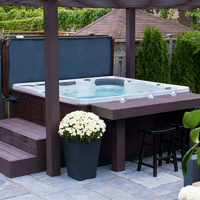 Often, backyard hot tubs tend to be incorporated into a newly built deck or some beautiful landscaping upgrades. In the simplest form, you can place your hot tub on a concrete slab in your backyard. Then place some lush vegetation and fashionable accessories in the area. For those that are interested in building a new deck, they enjoy the benefit of extending their living areas. Bathers can easily pop in and out during any time of the year, giving options for creating a specific and unique outdoor experience. A deck provides plenty of space for bathers to move around and sit while socializing. It also gives you the option to install an outdoor kitchen, fireplace, or tiki bar. When you purchase a hot tub for your home you are going to find immediate benefits to your health, then down the road, you will find benefits to the value of your home once put on the market. If you are interested in learning more about the healing benefits of hydrotherapy, click here to download your hot tub buyer’s guide.